Natural, Fresh, Long Lasting… Everything true love should be! Moose Meadows Farm introduced these wreaths in 2008. Comprised of triple layers of evergreen boughs “wrapped” onto a 18″ heart shaped or 12” circular frame, these wreaths are perfectly suited to show a special person everlasting affection. 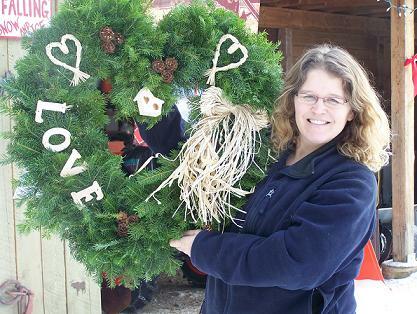 The final dimensions for the heart shaped wreath is approximately 26”. 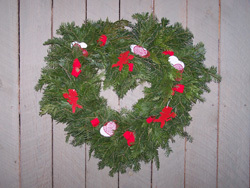 Unlike cut flowers, which are most often imported from Latin America, Asia and East Africa where they are grown in huge green houses and production has shifted from food crops to flowers, these fresh wreaths are Canadian made and comprised of fresh, natural materials collected in a sustainable manner. Whereas cut flowers may last a few days to possibly a week or so, in cool climates these wreaths will last well past Valentines Day and possibly into March or April. Moose Meadows Farm is proud of its efforts to offer local alternatives to non-Canadian and / or “non-green” products. 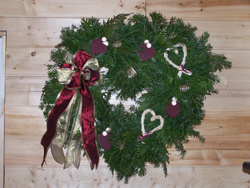 It is also proud that its wreath production has a minimal impact on the environment. 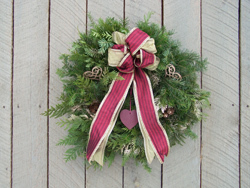 All our Valentine Sweetheart Wreaths are comprised of fresh boughs of Douglas fir (Pseudotsuga meniziesii) and / or subalpine fir (Abies lasiocarpa). This wreath is decorated with 3 red cupids, red velvet all weather ribbon loops (5 singles & 3 doubles) and 4 white 3” wood hearts overlaid with 4 red 3” sinamay (woven straw) hearts. Cupido is latin for “desire”. This mixed wreath is decorated with a large double burgundy & gold bow, 2 willow 4” hearts, four burgundy 3” wood hearts with two gold berries, and 5 gold ribbon loops. Bow colour may vary slightly. 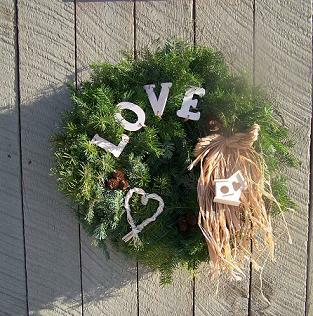 This wreath is decorated with 3” wooden letters spelling “LOVE”, a raffia bow, 2 willow 4” hearts, 3 Douglas fir cone clusters and a small wooden birdhouse. This wreath is “green” in that none of the decorations are artificial. NOTE: These wreaths can be shipped anywhere in Canada or into the United States. Final price will be adjusted and is dependent upon destination of wreath. Please contact us for additional information. This handcrafted 20” circular wreath is tastefully decorated with a double ribbon bow, 2 gold 3” wooden scroll hearts, 2 gold spruce cone clusters and a burgundy wooden heart hanging in the middle. Ribbon colours may not be exactly as shown. The boughs have been dusted with gold. As wreaths have no ending, its shape depicts everlasting affection and love. 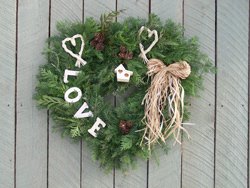 This evergreen “circle” is decorated with a raffia bow with small bird house, 3 small cone clusters, a willow heart and plenty of “LOVE”. As circles have no ending, its shape depicts perfect and continuous love.